The fiancé and I decided a while back to go to Africa for our winter vacation. We’re a little Central America’d out at the moment – after visiting Panama, Cuba and Guatemala within three years, we felt we needed a bit of change this year. But we wanted something easy – something that was different, but that wouldn’t tax our abilities to travel around and see as much as we could. We settled on doing a tour with Intrepid Travel, and after a bit of discussion (we knew we wanted to do Southern Africa, we just weren’t sure where exactly) we picked their Okavango Experience trip. The dates were right, the price was right, and the length was right. 10 days, starting in Johannesburg, South Africa; through Botswana, and ending in Victoria Falls, Zimbabwe. The first day of an Intrepid Tour is always your own, with a group meeting in the evening. We spent the day on a city Hop-On Hop-Off tour – in addition to being tired and unfamiliar with the city, it was also Boxing Day and a lot of things (shops, museums and tourist site s) were closed, so it seemed like a good option. We got a great overview of the city, as well as a fantastic 2-hour tour of Soweto as an extension. We had a local tour guide of Soweto, which gave us a lot of insight into the township. We started off driving by the stadium from the World Cup, then onto the cooling towers, that have been turning into a bungee jump (alas, we saw no jumpers). Fans of ‘An Idiot Abroad’ will be familiar with the painted towers from season 2. After the cooling towers, we headed to the Hector Pieterson Memorial and museum. We were given a brief history of the Soweto Uprising, and what precipitated it. We continued on, visiting Nelson Mandela’s house, and Desmond Tutu’s house, before passing through Kliptown. Again, because it was Boxing Day, a lot of places were closed and we only got an outside look. It was definitely a tour that I would recommend. Back at the hotel, we met the rest of our tour mates – 2 couples from Switzerland, a couple from New Zealand, and a lot of Aussies (ok, so only 8, but it seemed like a lot). First meetings are always so awkward – not knowing anything about anyone, and everyone standing around uncomfortably….it would take a few days (as well as $120USD, a mokoro, 20 bottles of water and a lot of beer) for everyone to gel. We set off bright and way too early the next day – we were on the road by 4:30 am, as we had an 11-ish hour drive to get to the Khama Rhino Sanctuary in Botswana. We stopped around 8:30 for breakfast at a truck stop, getting coffee at a Wimpy’s (think Burger King/McDonald’s/Harvey’s) before hitting the road again. Just before the South Africa/Botswana border, we stopped to stock up on lunch and snack foods for the next few days. The border was quick and easy – we lined up all together, had our passports collected, stamped, and then passed back at the South African border, before we drove to the Botswana side to repeat the exercise. After that it was smooth driving to the Rhino Sanctuary. Seeing as it was summer in Botswana, we got to see babies – everywhere the eye could see babies! Baby impala, baby rhinos…those a some big babies. Our driver was very knowledgeable about the animals, and every time we stopped, he would turn off the vehicle, turn around and tell us about their lifespans, their markings, and their habits. The one caution is that the game drive starts at reception, but ends at the campsite – so if you want anything from the small store (souvenirs, cold drinks) get it before you head off. The campsite at the sanctuary was great – there was a tap with running water, a fire pit, and lots of shade. The comfort station was a short walk away, and soap and toilet paper were provided. (The toilets, and shower stalls, were very clean and well maintained.) We were given a warning to always check outside the tent before we left it – mostly for snakes, but also scorpions. We were also warned that the area we were camped in was the area that the black rhinos liked, so to be careful of any large and new “rocks” that may be in our path as we went to the comfort station at night. The next day we were up early (but not as early) for the drive to Maun, and the Okavango delta. We spent one night in Maun, before heading, via mokoro (the traditional dugout canoe) into the delta. The two nights that we spent in the delta proved to be the bonding experience that we all needed. The day before we left to go into the Delta, we were given some time to shop for snacks, and drinks, in Maun. We were told to buy 5L each of water, and any additional drinks (alcoholic, or non) that we might like for the trip. Only…the bottle stores (or beer/liquor stores) were all closed. Not really a problem, just…it might have been nice to have a few beers around the fire at night. We all bought our water, filled our water bottles (The Fiancé/ and I had 12 litres total) and headed to the small village where we were starting our bush camp experience. Off we set, 2 people per mokoro, with a ‘poler’ at the back. We headed 2 hours into the delta, and set up camp on what is usually an island, but currently isn’t because of the drought affecting the area. The drought also meant that the polers had to manouver the mokoros around the sandbars that had cropped up in the river. The water was incredibly shallow in places, and even though the mokoros don’t sit heavy in the water, they still got stuck upon occasion. Once at our campsite, we had lots of trees providing shade, and a small swimming area in the river just to the right of the campsite. We got ourselves set up, had lunch, and then…..changed into swimsuits (well, I changed into a swimsuit top and yoga pants, because I couldn’t find my bikini bottoms the first day), and hit the water, because it was 43C and really, really, really hot. Alas, the water was no cooler than the air, so it felt like taking a very warm bath (a warm, silty, mud covered bottom bath) with several near strangers. Occasionally we’d get a wave of cooler water around our feet, but it was overwhelming weirdly warm water. One of the Swiss guys had a small ball that he pulled out, so we played catch, drawing in a few of the polers, and helping to break the ice. “Wouldn’t it be nice to have a cold beer right about now?” We started joking. “The polers could make some serious cash if they just poled by all the campsites with a cooler of beer!” And we all laughed, and thought nothing else of it. Several of us wanted to learn how to pole the mokoro, so one of the polers took us out, one-by-one, to teach us how. The hardest part is the balance – unlike stand-up paddle boarding, you’re at the back of the mokoro. Your feet are in a T formation, with the back foot being the top of the T. You slide the pole into the water nearly touching (or touching) the mokoro beside you, and push back. If you need to turn, you ‘sweep’ the mokoro in an arc in the water – a clockwise arc turns you right, and a counter clockwise arc turns you left. It’s tricky maintaining your balance while you pole – you’re shifting your weight around to move the pole back to your side for another push. That evening, around 5, we had a short game walk, seeing impala, elephants, zebras and a giraffe nearby. We were split into three groups, and our guides led us out and onto a large plain, telling us to walk single file (so as not to scare the animals). The three groups headed in different directions, although we all still ended up in the same spots, just not packed all together. Close to sunset, we started back. We had gone a fair distance from camp, so as we walked it got a little darker, a little darker, a litttttle darker….and then we heard it. A roar. A roar that wasn’t that far away. We all froze, mid-step, and stared. At each other, at the dark trees around us, at the guide. “An elephant” he said. (And after hearing a lot of elephants, yes, yes it was. Only at the time it did NOT sound like an elephant). Finally, just as the sun was setting, we arrived back in camp for dinner. The next morning we had a longer game walk (about 6 hours, and thankfully with no terrifying animal noises), and saw (in addition to the previously listed animals) a warthog, many more giraffes, baboons, wildebeest and even hippos! As we headed back to camp, our guides (we had two for the second walk) stopped, spoke in the local language, and then led us back in the direction that we had come from. We pushed through reeds (it’s a very sad state of climate when you can visually tell that what you are walking should be water, but is instead not.) and came upon a largish pond. Wallowing in the middle were three hippos. Well worth the u-turn to see! Back in camp, it was announced that we were running out of water – somehow about 20L of water had gone missing. Our guide had brought an extra 40L as a back up, but somehow half of it had disappeared. He announced that he was going to try another camp a little farther down the river, to see if they had any water they could give us. (They had fewer tourists, but had brought the same amount of water.) He set off with one of the polers, and we changed into swimsuits to hit the river. And again the joking start – “Wouldn’t it be great to have a beer?” Only it didn’t stay a joke. The Fiancé told one of the polers that they could make some serious money by bringing beer into the delta, and the polers went with it! One of the polers offered to go back to town (remember – we were 2 hours from the nearest town) for beer. We just needed to give him a list. We celebrated New Year’s Eve with a buffet dinner, music, and some dancing (or so I’m told – we ended up going to bed early, as we had to be up at 6 am the next day.) Then it was off to Nata, a short 4-hour drive away. In Nata, we did a game drive through a bird sanctuary located on the salt pans. Unfortunately, evidence of the drought was in full force and there was not a single flamingo or pelican to be seen (nor was there any water). We did see a few birds (ostrich, a secretary bird and a few migratory birds) but it was mostly empty, brown, sandy savannah. We did see on lone wildebeest, and a scrub hare, but that was it for mammals. The tour ended with sundowners on Makgadikgadi salt pan – a vast, empty salt pan. Our group had by this time gotten into a groove, so there were some goofy photos, some artistic photos, laughs and groans as we posed with the sunset backdrop. From Nata we drove to Kasane, located at the junction of 4 countries – Botswana, Namibia, Zambia and Zimbabwe. Kasane is a large tourist destination, as it’s close to Chobe Park, a good base for those who want to do a sunset river cruise or a game drive. Organized for us was a sunset cruise, but there was also an optional game drive of Chobe, which the Fiancé and I opted out – knowing that we were going to be doing a lot of drives in Hwange in a few days, we thought we’d use the time to relax by the pool at the hotel. At 3:30, those of us who opted out were driven down to the docks for our river cruise, where we promptly claimed the shaded side of the boat for our tour mates, who joined us a few minutes later. We had our coolers of beer, and our cameras ready to go. Almost immediately, we saw a hippo, and then young male elephants mock-fighting on the riverbank. The cruise lasted a couple of hours, and we ended up seeing lots of elephants, hippos (and tiny hippo babies! ), buffalo, and the odd crocodile. By sunset, our group had rearranged the chairs into a circle, and we were chatting away. Our tour ended in Victoria Falls, with the last activity being a walk through the Victoria Falls National Park on the Zim side. (Entrance is $30USD.) We were given the option of going whenever we wanted, our guide would either accompany us to the gate and pay, or we could submit a receipt to him for reimbursement. We choose to go the morning we arrived, and walked through the Park, stopping at all the viewpoints to see the falls. It was so wet, that at times we couldn’t decide if it was spray from the falls, or if it was raining. But given the heat – and it was hot – we quickly dried off as we moved away from the main falls (aptly called ‘Main Falls’). As we walked along, past Livingstone Island (and Devil’s Pool), the water started drying up – Horseshoe Falls and Rainbow Falls were both nearly dry, with only small trickles of water cascading over the edge. Main Falls is still dramatic, with massive amounts of water falling the 108m to the river at the floor of the canyon. We got a close up look the next day, when we walked over the border to Zambia, to visit Devil’s Pool. We hurried back to the camp after we walk along the falls, to be picked up by Lion Encounter. We drove about 20 minutes out of Vic Falls, and to their concession, where we got to walk with lions. The lions are about 2 years old, and have been raised by volunteers, so they are accustomed to humans. There are a few rules to remember – don’t wear anything that dangles, don’t get down on the ground, and don’t touch their heads. The lions, while used to humans, are still wild, and are still cats. They will play with anything that dangles, lies on the ground, or will try to grab a hand that is close their head. We were given walking sticks – again, just the sheer size of the lions means that if they want to play, you don’t want to use your hand to admonish them. You use the stick, because if part of that goes missing, no one needs to be rushed to a hospital. There were 6 of us on the tour (3 couples) and each person got a chance to walk with the lion. Typically, one person would go first, their partner would join, then the first person would drop back, and their partner would get a chance to walk alone with the lion. When the lions laid down, we were given the opportunity to rub their bellies (very coarse, rough fur! Not at all like a house cat or a dog) before they were up again and walking. During the walk, there are two guides, a videographer, and a guard (you are in the wild, and there are buffalo and elephants….) so safety is as assured as it can be. After our walk, we visited some older lions (and had our hands licked!) before heading back, and watching our video. While the Fiancé and I wore water shoes we needn’t have worried, the rocks aren’t that sharp…..but they are that warm. Because of the current, algae doesn’t have time to grow, so it’s not slippery either. We clambered across the rocks, and were instructed to slip into Devil’s Pool. (When the water is running very low, you can jump in). There is a “lifeguard” who is there as an added precaution – he sits closer to the edge, allaying your fears that you’re about to go over, and holds you when you lie on the rock ledge (the Armchair). There is another guide who takes pictures with your camera, and then leans over the waterfall to get a dramatic video of the water crashing over the edge. Each person gets a go and sitting on the armchair, and lying over the edge (or close to it, in my case) before the next person is ushered in, and you swim off to the side (not the rushing current side). After everyone’s photos are done, you rock scramble back to the river, swim back to the island, and sit down for food (while waiting for the adrenaline to wear off.) The morning tours include a snack, the lunch time tour has a three course meal, and the afternoon tour has tea. We were there for lunch, so we started with a gazpacho, followed by chicken and beer, roast veggies, steamed veggies, and couscous, before ending with a fruit cup for dessert. After our meal, we took the boat back to the hotel, and then walked back across the border (paying another $75 each in visa fees) before grabbing a cab to hotel. Our group had slowly broken apart over the two days in Vic Falls. Some people left early on for other adventures, some had an extra day to play before heading home, and a few were even continuing on with Intrepid for the trip back to Johannesburg (through Zimbabwe this time). Those of us that were left got together for dinner that evening, pulling in a few of the new people who had joined up for the tour back to Jo’burg, at the hotel restaurant. We started off with two tables, added a few more chairs, realized we had too many people, added another table…until we had 5 tables, and nearly 20 people sitting around, eating, drinking and having a good time. We ordered our meals, and those of us with crocodile, impala and warthog meat, shared it as it came out, passing bits of meat down to those who wanted to try something different, laughing and talking. As it got later, and people started leaving for bed, hugs and promises of places to stay made the rounds, until only a few of us were left. Lions and Leopards and Elephants, Oh My! I went on a five-day safari, through Tarangire National Park, the Serengeti, and the Ngorongoro Crater immediately after I climbed Kili. Overall, the safari was a wonderful experience. The people I was with, on the other hand, were a different matter all together. I left Moshi at 4:30 in the morning. The safari had actually started the day before, but of course I was just coming down off the mountain. Daniel, from Tro-Peaks (the company I did the Kili climb with) picked me up and drove me to the campsite, Zion Campsite, just outside Tarangire National Park. We arrived just in time for breakfast, and I got to meet my travelling companions for the next five days. I was with 5 Italians. If they had been dwarves they would have been: Complainer, Princess, Clubber, Insufferable and Nice. (Yes, one of them was actually a nice person, the others not so much.) Of course, the first day I didn’t know this. But over the next five days, their personalities became very clear. We set off for Tarangire right after breakfast. 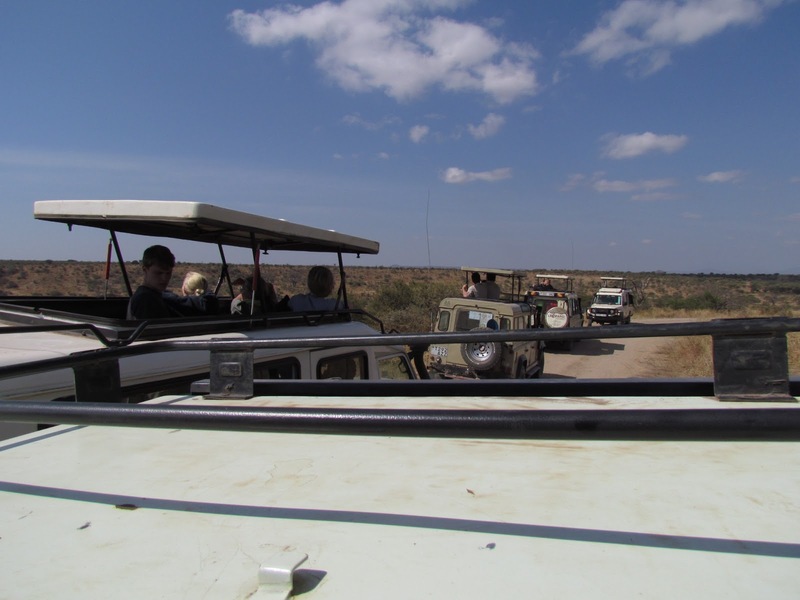 After registering at the gate, the top of land cruiser was popped open, and we began our game drive. We saw hundreds of elephants within the first half hour. (We were also charged by an angry elephant within the first half hour.) Most of the day was filled with different animals sightings – giraffes, zebras, gazelles, impalas, elephants, baboons, even a lion. 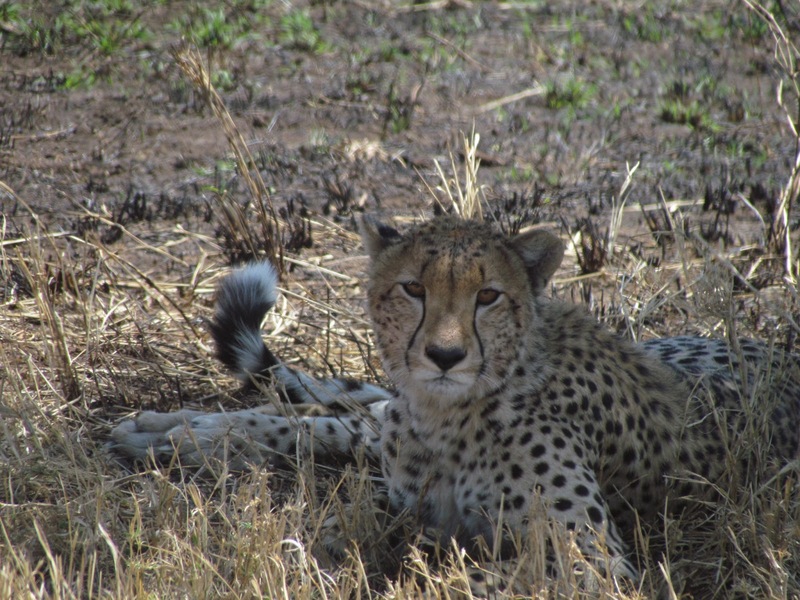 The next day it was off to the Serengeti – a long drive that took us through a few small towns (including a stop for groceries, and to get a fuse fixed so the Italians could charge their phones using a plug in the land cruiser. 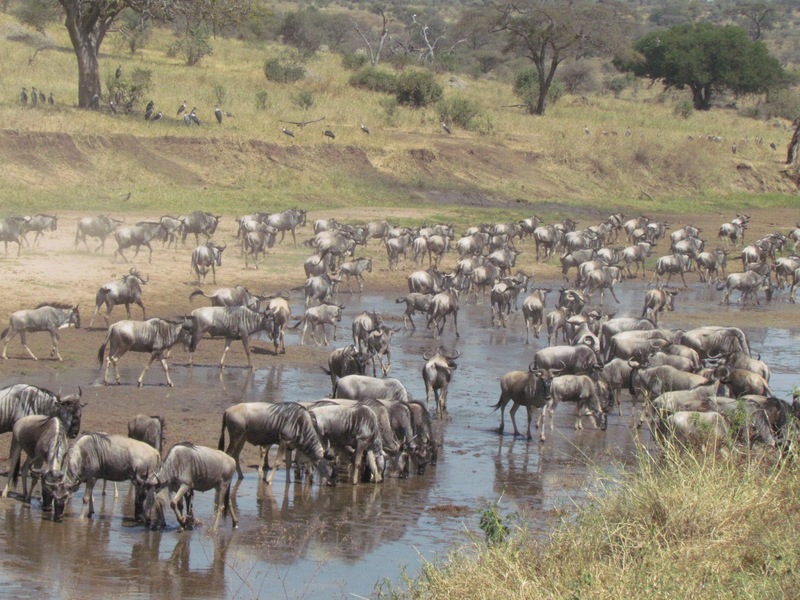 ), and the Ngorongoro Conservation Area. The Serengti was indescribable. I’ll still try, but it was….one of the spots that you could easily see yourself spending the rest of your life. The light in the morning, when the sun rose was an incredible rosy colour, and at dusk when it was setting, the light seemed to hang in the air. 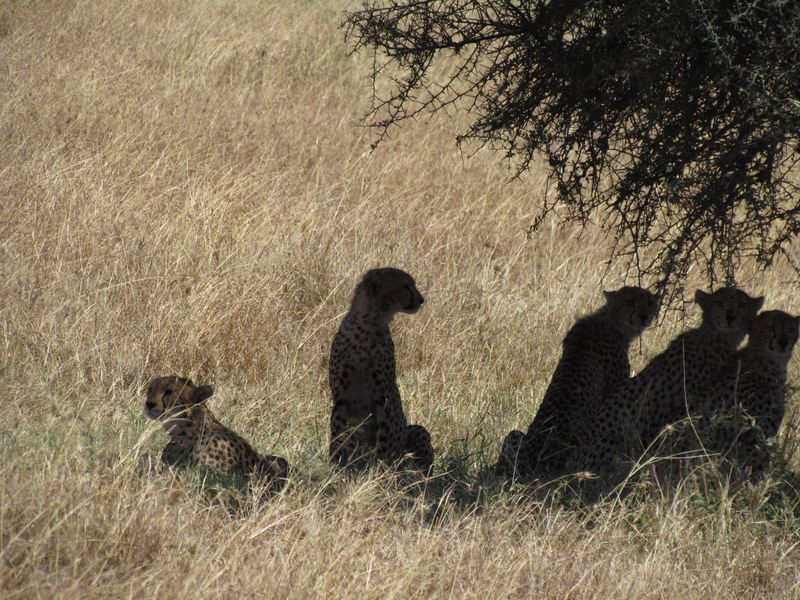 We saw evrything – leopards in trees, more elephants, more lions, cheetahs, zebras, antelopes, a hippo pool. 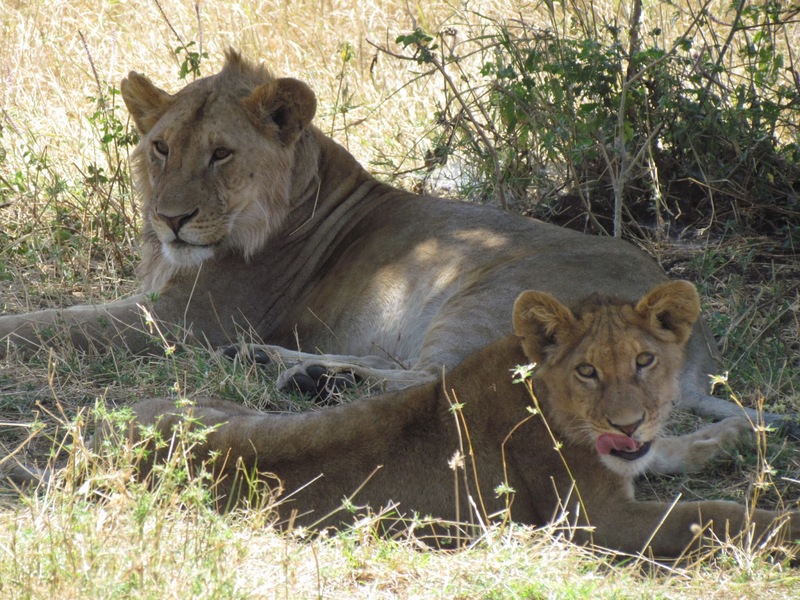 At times the animals were close enough that we didn’t need a zoom – we saw a coalition of cheetahs lazing under a tree on the side of the road; at another time we saw a pride of lions (including an adorable baby) resting under a tree, you guessed, on the side of the road. At night, you could hear the hyenas as they prowled near the kitchens. Thankfully, they were the only visitors (that I know of) to our camp. Our final morning in Serengeti we woke early to take an early morning game drive through the park. Then it was back to pack up the landcruiser, and head to the Ngorongoro Crater, after a stop at a Maasai village straddling the Serengeti the Ngorongoro conservation area. At the NCA, we set up camp at Simba camp, the most popular camp at the top of the crater. 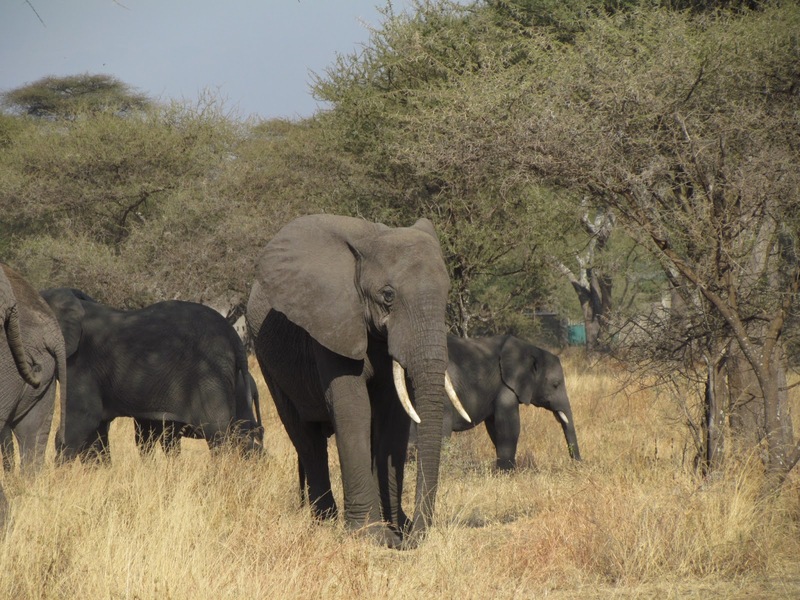 It wasn’t hard to see why – with an elephant grazing on trees and bushes behind the mess hall, and a herd of zebras chilling on the grassy plain of the camp site, we had our fair share of wild visitors. Our final moring we started the drive into the crater. One word of warning to anyone hoping to do a game drive in the crater, it’s cold. Pack several layers of fleece because you will definitely need it. One of the Italians on my trip pulled out her sleeping bag – another solution, but one that leaves you with fewer photo taking options. The Ngorongoro crater was…flat. There were a few trees, but for the most part you could see it stretching out in all directions until it was lost in the early morning haze. I have to admit that by this point I was a little safaried out. I had seen pretty much every animal there was to see, with two notable exceptions. Servals, a small(ish) wild African cat, and a rhino. 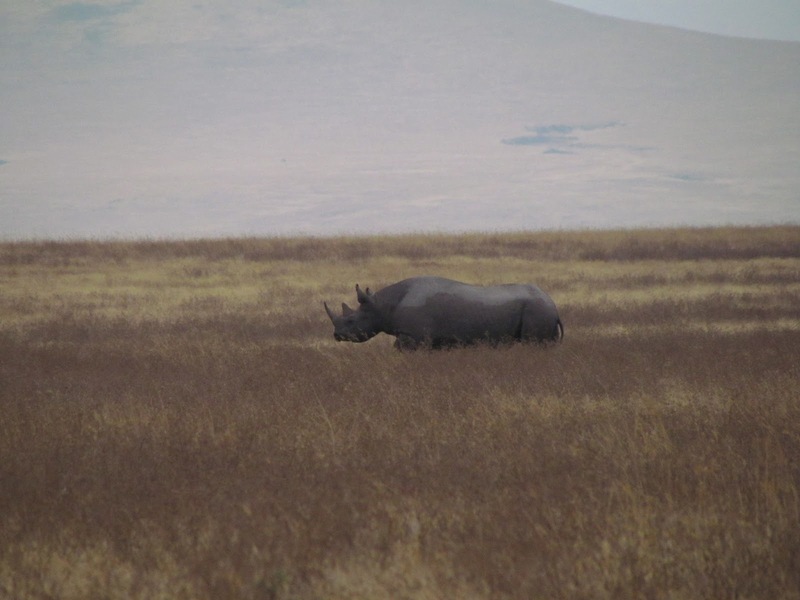 There aren’t many rhinos in Ngorongoro – there were 18 in 2001 (statistic found here), and the crater itself is 260 km sq, or 100 sq mi. However, withing a very short time of arriving, our driver suddenly changed directions, and began driving off down the road into a great expanse of green. We all wondered what was going – we had just been watching a mating dance between ostriches, and couldn’t figure out why we had so suddenly taken off. Turns out our driver had either heard news of, or had seen himself, a rhino off in the distance. And there he (she?) was – lumbering away in the distance. The closest we got was maybe 100 metres (maybe 150 – it was hard to judge the distance) but it wasn’t particularly close. With my zoom lens (35x zoom) I got a fairly decent photo. I never did get to see a serval. I booked a 7 day Kilimanjaro climb back in April. 5 and a half days up, one and a half days down. I figured I’d need the 5 days for acclimatization – Ottawa isn’t exactly at a staggering altitude, you know. Turns out – I was wrong. The first leg took me from Machame Gate to Machame Gate, and from there the next day to Shira Camp, where we get our first taste of “high” altitude (i.e. over 3000 metres). I had just spent 4 days in Addis Ababa, which sits around 2500 metres, so the first two days were easy. Which probably explains why I was the first tourist to arrive in Shira Camp. The day after we hit Shira Camp, we hiked to Barranco, via Lava Tower. The side trip to Lava Tower is important for acclimatization – you hit over 4600 metres, before descending back down to just under 4000 metres at Barranco. The next day, our fourth, saw me tackle the Barranco wall (aka the Breakfast Wall, because you do it right after breakfast). I have to say – I loved this part. I loved scrambling over the rocks, hugging them as I swung a leg out to land on the next “step”. From Barranco, our goal was Karanga Camp (which in my mind will always be Kangaroo Camp). Being the speedy trekker than I am, my guide and crew decided that we should push on for Barafu camp – the camp before the summit. Did I mention that my guide thought I could summit a day early? So on day 5, at 5 am, I made the push for Uhuru Peak – the highest peak in Africa. After what seemed an interminable age of zig-zags up the cliff face, we finally (and I mean finally – there were six or seven false summits!) came up to….Stella Point. The second highest point in Africa. Another hour of staggering found me at Uhuru Peak. Where I promptly fell against the sign while my guide too my photo. 5895 metres is nothing to sneeze at. We quickly descended, and I found a mild-to-moderate case of altitude sickness come on. No headache, which is normal for me in high altitudes, but nausea. And back at Barafu, where I gratefully fell upon my sleeping bag for a quick nap, I actually vomited upon waking. Classy as always. We pushed on from Barafu that day, to Millennium Camp – a new campsite that was installed in 2000 as a relief measure for all the people wanting to celebrate the New Years on Kilimanjaro, but who couldn’t take the altitude. Needless to say, I was in my sleeping bag early, exhausting after the 7 hour hike to the summit, and 3 hours descent. 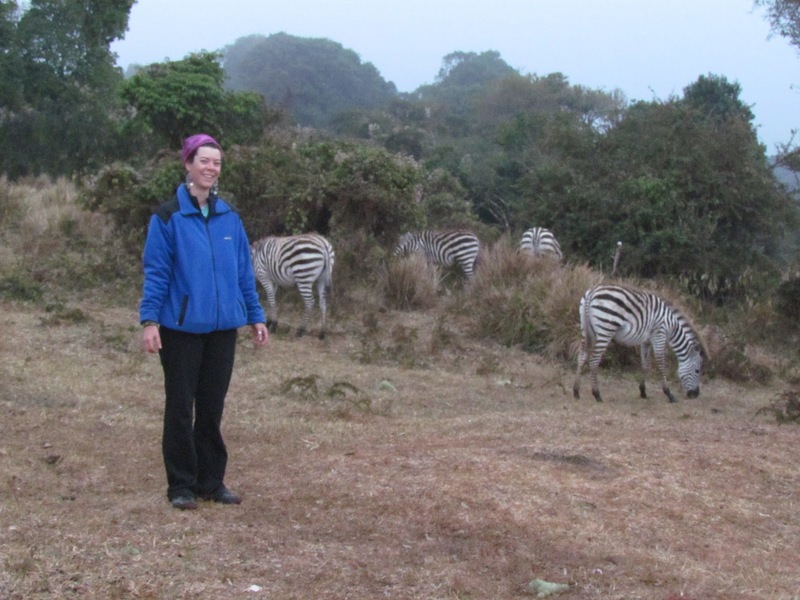 The next morning we pushed on down to Mweka Gate – a leisurely 4 and a half hour hike down slippery, rocky paths. I seriously started to consider that they should award certificates for getting down the path safely, rather than for making the summit! Oh, and the certificate for making the summit? I have one of those! 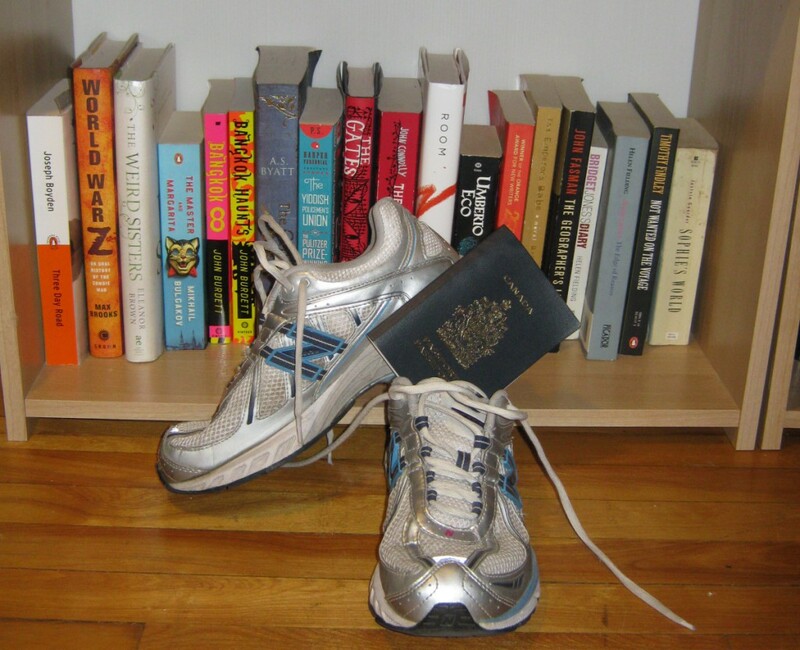 I’m off in less than a hour to climb Kilimanjaro – the highest mountain in Africa. Sitting at over 5800 metres (5895 metres to be exact), Kilimanjaro towers overs the plains below. I’m sitting in a hotel in Moshi, a small town near the base of Kilimanjaro, waiting for my trek company, Tro-Peaks to pick me up. I spent last night re-packing bags – putting everything I would need for Kili (fleece sweaters and pants, sneakers for the campsites, wool socks, mitts and a toque, base layers and gaiters) into a bag that porters will carry for me. In another, smaller, day-pack, I’ve got my day-to-day items – camera, bandaids, binoculars and water that I’ll carry. I think I’m ready. The company told me to take it one day at a time – don’t try to climb the peak before you get there. Just look to what you’re doing now, go slowly, stay hydrated, rest and eat. Those are the keys to reaching the summit. I’ve prepared by hiking in the Adirondacks with a friend, and by walking as much as possible. Here’s hoping it’s been enough! See you in a week, after I’ve conquered the snows of Kilimanjaro! Well, it’s been nearly a week since I left Canada. It took what seemed forever to arrive in Africa – a two-hour delay for my flight to Washington, an overnight layover in Dulles airport (that makes 4 airports that I’ve slept in) and then a nearly 14 hour flight to Addis, getting in around 8 am on August 2. So here am I am now in Moshi, having a rest day in preparation of Kilimanjaro tomorrow. I’ve met with the trek company, and I’ve packed my bags. Here we go! That’s it – day of departure. Time to blow this popsicle stand of a city, and catch a flight out. I’ve got my bags pack and I’m ready to go (note to self: Play “Leaving On A Jet Plane”). The current plan is to mail home the remnants of clothing from my Kili climb – the fleeces (minus one fleece top, which will be my sweater for the cooler days and nights on the rest of my trip), the gaiters, the heavier weight socks, and the wicking base-layers. And since the Kili climb is at the beginning, all the energy bars and snacks (trail mix, energy chews, granola bars) will be mostly gone as well, freeing up even more space. I’m hoping to be down to one bag by the time I fly to Rwanda. I’ll update when I can. I hear internet can be spotty at best in some of the places I’m hitting.